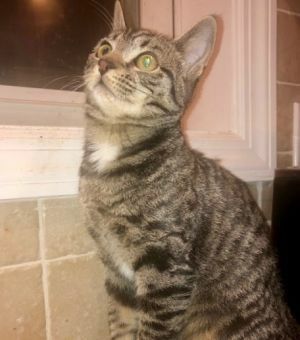 Hi, my name is TERIYAKI andI am a 3 ½ month old female TABBY kitten. As you can see from my photo, I have purr-fect SYMMETRICAL markings on my face and body. I am so FUZZY and CUTE. I’m a typical kitten who is Full of ENERGY too. I really enjoy PLAYING with other kittens. That is why I MUST go to a home with another cat or kitten so I always have a PAL to PLAY and snuggle with. Come and meet me in Westchester, NY. I am spayed, UTD on shots, and FIV/FeLV negative. * Please note that kittens must be adopted in pairs or to a home with a current playful cat (some of our kittens can go to a home with a playful dog).